Over the next few days, I came to realize that Lebanon is a place of many names. The Paris of the Middle East, the Switzerland of the Middle East (due to its neutral disposition as the middle child between Syria and Israel? ), and the Gateway to the Middle East. It is the last name I like the best, even though the nod to Lebanon’s resemblance of Europe is fairly accurate. Lebanon’s position on the Mediterranean tasks it with acting exactly like a gate: it is a channel through which to pass to access those dry and mysterious countries, which means it is also a point of convergence for Europe and the Middle East. And Beirut epitomizes this convergence exquisitely. This we discovered almost immediately on our first day in Lebanon, waking after ten to breakfast at a trendy little café called Urbanista, located on the appropriately-named Bliss Street. We chose a comfortable table nestled beside a fern, providing us with a strategic position for people-watching. Since we had left the hotel, we had felt slightly out of our element. “Are you sure it’s okay to wear shorts?” we’d asked. “I don’t see anyone else in shorts,” Laina pointed out after a few minutes in the street. Loraine assured us that it was not like Cairo here in Beirut, that people wore shorts and tank tops and hijabs and niquabs. Twice I spotted two women fully covered, their eyes invisible behind the sheer black cloth. To see a woman so fully veiled – something I’d never even seen in Cairo – walking beside a young woman with exposed shoulders and midriff, illustrates my point: Beirut is an amalgam. Even in Istanbul, the city spanning two continents and bridging the east and the west, I hadn’t seen anything so drastic. That afternoon, we spent two hours walking through the city, admiring its art, architecture, and breezy views of the Mediterranean, always a blue blur visible from the hilly streets of Beirut. 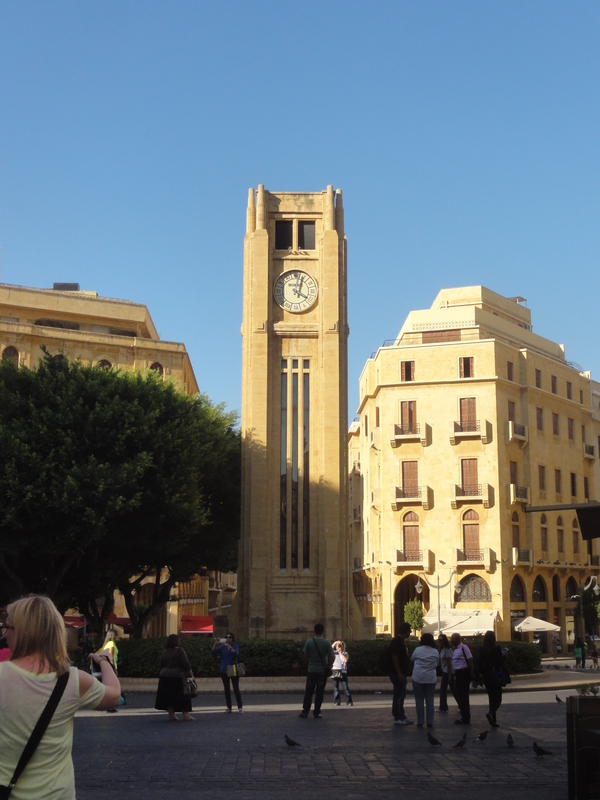 Because Beirut has been occupied by so many countries – Italy during the Roman Empire, France, America during the war, Syria, Palestine – its buildings bear the structural signatures of a plethora of cultures and historical time periods. This was evident around every corner; the city was an architectural smorgasbord. “This street reminds me of Paris,” Sally would say as we turned down a narrow, cobblestone street. We would nod in agreement, walk a block, and emerge on the broad Corniche running alongside the sea. Here, the palm tree studded promenade recalled sunkissed rollerbladers on a boardwalk in SoCal, only this stretch was mostly empty. 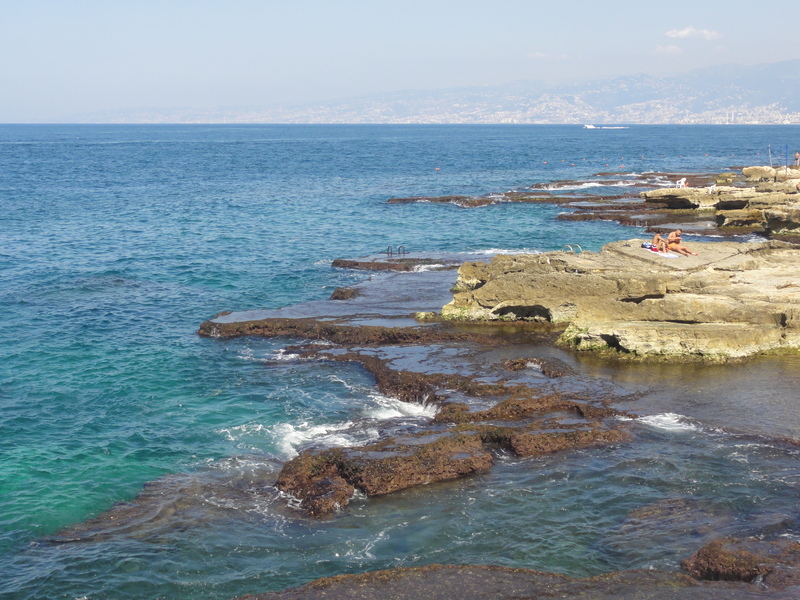 Down below, the Mediterranean crashed against the pier and lathered flat rocks with salty foam. What was especially neat – and tempting, as the afternoon sun baked overhead – were the iron ladders drilled into these rocks to allow bathers access to the water. 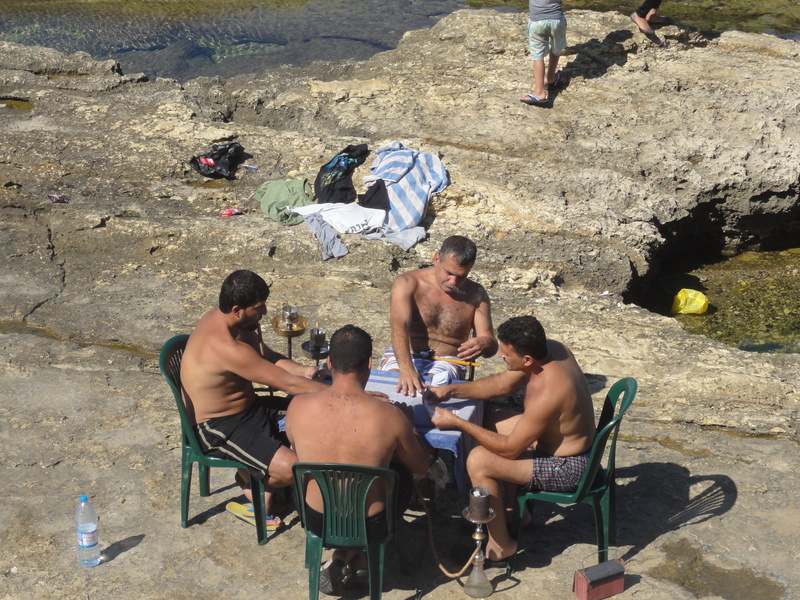 As we walked, we spotted men passing their afternoons on the rocks, spread eagle and glistening in the sun or smoking shisha – bubbly as it’s known here – and playing cards. This may have been true, but as I watched them dive from the rocks into the clear water, I didn’t think they had it all too rough. 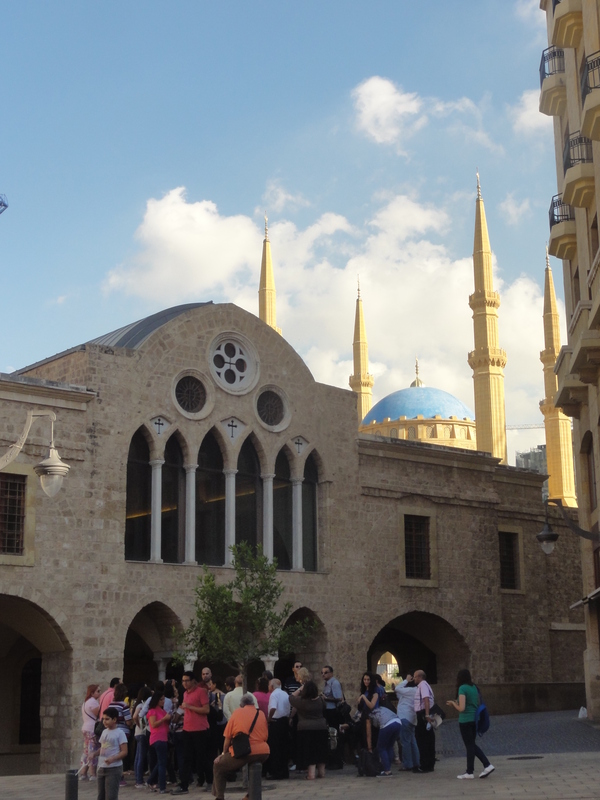 Unable to join them, we crossed the street to walk in the shade and turned down a street where Beirut’s souks are located, only they don’t resemble Egypt’s khan-el-khalili at all. Instead, a clean mall stood on the corner bearing familiar shop names like H&M and Zara, where we ducked in to buy dresses for later. It is worth mentioning a few things about Lebanon at this point. First, it is expensive. Loraine encouraged me to withdraw 100,000 Lebanese Livre, the equivalent to roughly $66, assuring me that it would last. The second thing worth observing is the fact that plastic surgery is widely available, fairly common, and indiscreet. What I mean by this is that back in the US, if a person undergoes a rhinoplasty or lip injections, the accepted recovery process involves not leaving the house until the surgery has completely healed. Here, it is common to find women – and plenty of men – out for an afternoon stroll with white bandages plastered over their noses or bruises beneath their eyes. In the United States, cosmetic surgery exists in a private space; in Lebanon, it’s out in the open. While we tried on dresses in Zara, well-endowed women bearing facial bandages squeezed into tube dresses in fitting rooms beside us. I’m not passing judgment here; it’s just that the difference is shocking. This is also considering a recent publication by The Independent ranking the United States as the leading country for plastic surgery, with 1,452,356 operations in 2013. We marveled at this as we headed down the street to a café for shisha, until we rounded the corner. “Now we’re in Spain,” Sally remarked. Confronted with a large Rolex clock tower situated in the center of a very Spanish-looking plaza, we strolled around the cobblestone square photographing the dipping alleyways and sidewalk cafes. The plaza was free of vehicles, occupied only by an army of pigeons slowly circling a man tossing them food. Beyond the Rolex tower, a sapphire-domed mosque and its minarets blared the call to prayer, which echoed off the imposing church right beside it. It was yet another obvious juxtaposition of religions, just like the Christ statue on the hill, not unlike Rio’s Redeemer, overlooking Beirut as residents celebrated the Muslim holiday of Eid. Incredible. It was a city of opposites, and as we rode home through its tall, bright buildings, groceries in hand, I couldn’t wait to see more of it.